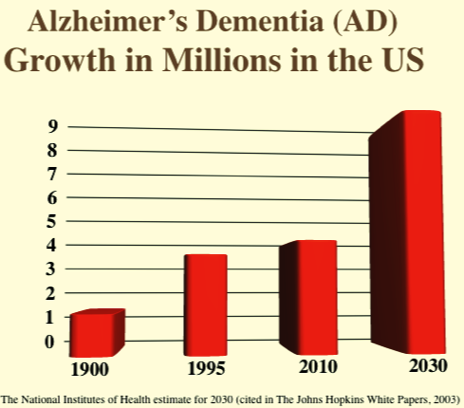 Worldwide, it is expected that 81 million people will be living with dementia by 2040. It has been estimated that the cost of caring for all the baby boomers with Alzheimer's in 25 years will exceed the entire United States federal budget. Happily, a recent study published in JAMA in 2017 by Dr. Ken Langa et al. found the prevalence of dementia had dropped from 12% to 9% from 2000–2012. There are still more cases each year, but their rate seems to be lessening. This means the red bar in the above graph may not be quite so tall in 2030. Dr. Langa's study could not determine why the rate of new dementia cases is dropping, but the most likely reasons are better and more widespread control of blood pressure, diabetes, and even higher levels of education in more recent years seem to be the most likely beneficial factors. Yes, there is a connection between the more education a person has resulting in less likelihood of Alzheimer's. The changes in the brain (pathology) start decades before a person shows symptoms such as short-term memory difficulty. This argues for encouraging behaviors throughout life to reduce risk of dementia and this includes seeking out and participating in educational and social activities throughout adulthood.